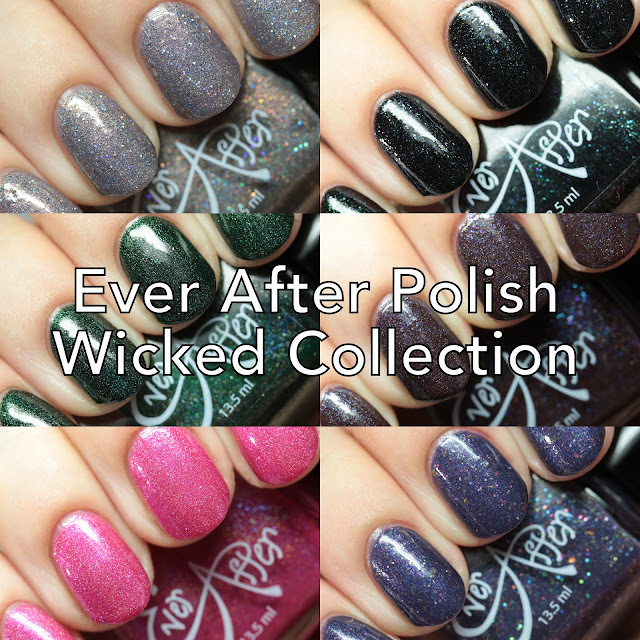 Ever After Polish's Wicked Collection debut at Polish Con 2016 and it is now available online. Inspired by the musical, it features six sparkling shades. Let's have a look! Dancing Through Life is a taupe gray jelly with gold microflakes, scattered holo, and silver holo microglitter. It is worn here in three thin coats. It dries with some texture due to the glitters. I wore this to Polish Con and it held up like a champ through packing, messing around with my car engine, and hauling things around! 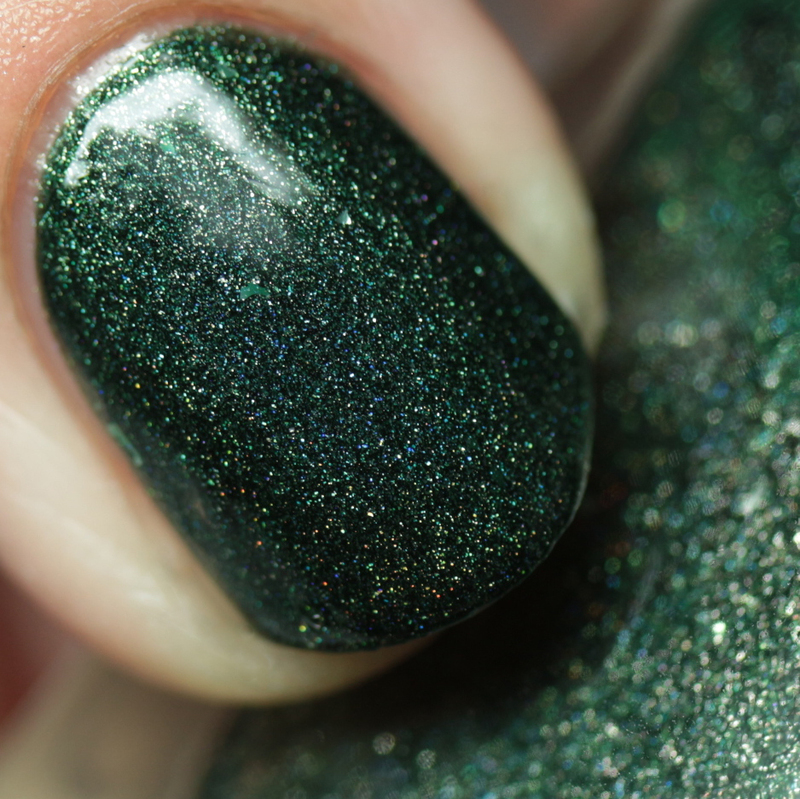 Defying Gravity is a black jelly with scattered holo, green microflakes and duochrome blue/magenta microflakes, worn here in three thin coats. This also has a bit of texture due to the flakes. Great dry time. Emerald City is probably my favorite from the collection! 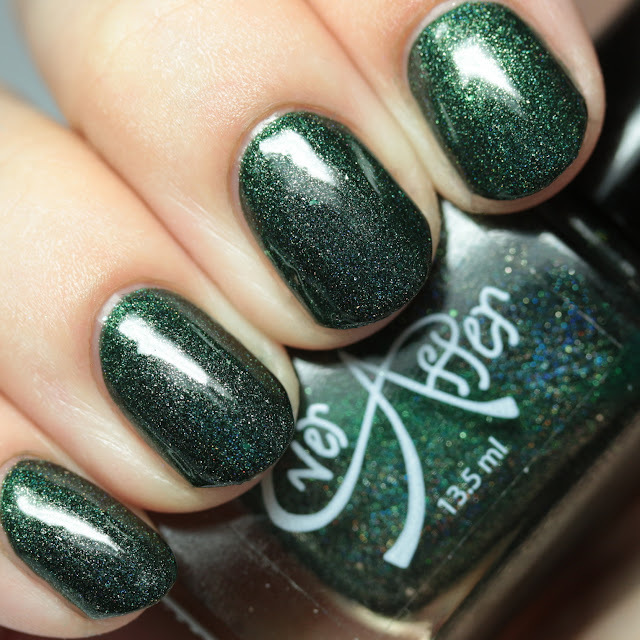 It is a forest green scattered holo with silver flakes. It is worn here in two thin coats and dries quickly and smoothly. Fly My Pretties Fly is a dark brown purple jelly with scattered holo shimmer, indigo flakes, and aqua and magenta microflakes, worn here in three thin coats. Great formula with a slight bit of texture due to the flakes. Popular is a barbie pink scattered holo with duochrome blue/magenta microflakes. Quick dry time with a bit of texture due to the flakes. Worn here in three thin coats. 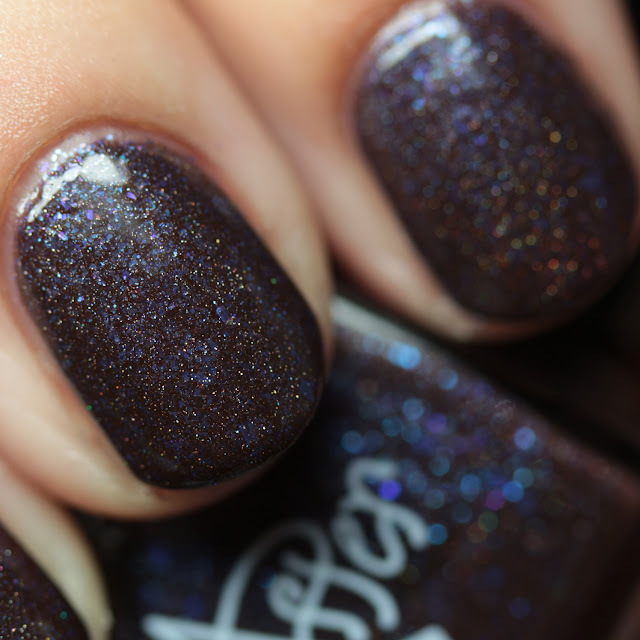 Unadulterated Loathing is a grayish dark purple with multichrome flakes, silver flakes, silver holo microglitters, and scattered holo shimmer, worn here in three thin coats. This dries quickly and fairly smooth. The Wicked Collection is available now on the Ever After site. See any you want? Are you a fan of the musical?